When this debacle around Section 44 of the Australian Constitution started becoming apparent, I found myself amused. The fact that a group of white politicians were falling victim to a section I believed was inherently xenophobic, particularly when some of those same politicians have been integral in fanning xenophobia to win votes, contained a delicious irony. Yet as the weeks went by and more and more politicians started having their citizenship scrutinised, as an avowed lefty I increasingly found that I was out of step with much of the left's reaction. We were not laughing for the same reason. 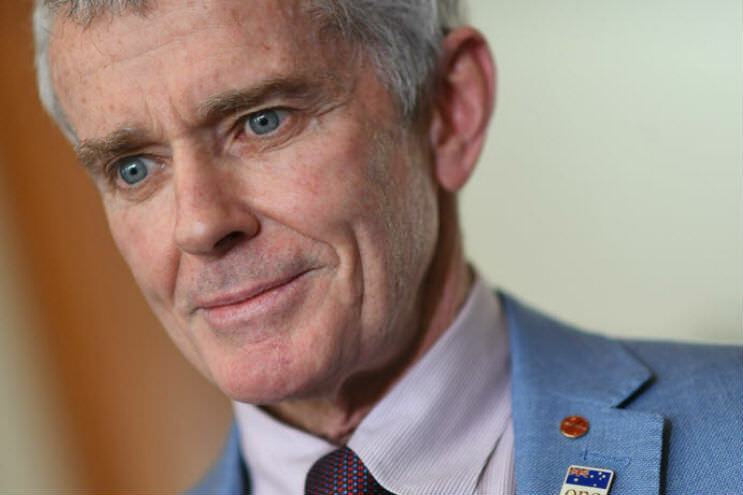 It seemed enough for many 'progressives' that the majority of the people who had fallen by the dual citizenship wayside were Coalition members, with the added bonus of Malcolm Roberts of the One Nation Party (pictured). I witnessed statements about how these politicians did not 'follow the rules'. I saw Greens who were similarly afflicted stand down in respect for 'the rules'. I began to wonder why what is essentially an issue of racism and discrimination was not considered a priority for those who state they believe in social justice. I have been a vocal critic of the campaign for constitutional recognition of Aboriginal and Torres Strait Islander peoples. I maintain a hard line that first and foremost, we need to rectify the wrongs and come to agreements in the form of treaties. I believe we need land rights, the return of Stolen Wages, due compensation for the Stolen Generations and a respect for our self-determination as peoples. Constitutional recognition was never going to do this. Indeed, as the years dragged on it became apparent that the only type of recognition the government was interested in was symbolic — confirmed by Prime Minister Turnbull's recent rejection of the conservative proposal to have an Indigenous political voice enshrined in the Constitution. Though ultimately it was the determination of Aboriginal and Torres Strait Islander people to fight for real rights which brought the Recognise campaign down, by the time the government was through with it we may as well have voted 'yes' to Howard's weak preamble proposition in 1999. Yet that movement did not start out this way. When the Expert Panel on Constitutional Recognition handed down their report in 2012, it was an extensive document which examined not only a wide variety of community responses to the type of recognition we were interested in, but also the likelihood of whether these would succeed should they go to public referendum vote. It's maddening that successive governments let this work be whittled down to nothing, because regardless of many Indigenous people's issues regarding constitutional recognition, the report illustrated that there were racist provisions contained within the Constitution, and that Aboriginal people supported these being rectified or removed. "It's troubling that so many on the left are not fighting this battle; that they are simply stating that these are 'the rules' and celebrating the downfall of certain politicians while ignoring these same rules' horrific legacy." A massive opportunity was missed here. Instead of spending millions of dollars on a campaign which the government wanted to fail because they had no intention of recognising Indigenous rights, why did they not instead examine this extensive report for its worth and contemplate various directions? The responsibility of removing racism from the Constitution lies not with Indigenous people — for the Constitution was written under the false doctrine of 'terra nullius' and as far as the writers were concerned, we simply did not exist — but on a government with a commitment to a non-discriminatory future. Section 25, for example, sets out the right for federal representative seats to be reduced by a proportionate number if a state or states have excluded people of certain races from voting. While it has been argued that this is essentially an anti-racism provision, the fact that it still allows for states to bar people from voting based on race is inherently racist. Here's an interesting historical fact: in all states bar Qld and WA, Aboriginal men had the assumed right to vote prior to Federation — and indeed, from 1895, Aboriginal women in South Australia could also vote, due to women's suffrage being achieved there. Then along came the Commonwealth Franchise Act 1902 which, while giving women suffrage, excluded a range of groups such as Indigenous people, Indians, Africans and so forth. Indeed, those who weren't considered subjects of the British Empire were excluded. This is particularly interesting in the case of Indians as they actually were subjects but became excluded on the basis of the act excluding 'Asians'. It was therefore mere months after the Constitution was installed — with its Section 44 barring those with a 'foreign allegiance' (again intended to bar those who were not British subjects) from holding seats — that the government was banning various non-white groups from voting. Tie this in with the fact that the White Australia Policy limiting non-white immigration was already in effect and we have a cluster of laws and rules which were born of racism and which are currently playing out in ways never intended. The 'race power' within the Constitution, Section 51.26, gave the government the right to make laws pertaining to people of any race 'other than the Aboriginal race in any state, for whom it is deemed necessary to make special laws', thus leaving Aboriginal people subjected to various state-based atrocities such as missions and unpaid labour. In 1967 this power was amended to instead give the Commonwealth government powers to make these laws. This section has since been used for items such as the introduction of the Northern Territory Intervention. Yet while Aboriginal people have been targeted in specific ways via 51.26, it was actually introduced in response to Chinese, Kanaka and other 'foreign' groups, as a way of restricting their labour and trying to send them back to their home countries. The Expert Panel report focused on Section 25 and Section 51.26 because their focus was constitutional recognition for Aboriginal and Torres Strait Islander people, and these are sections which have had specific impacts upon our lives. The idea that Section 44 could also impact Indigenous rights didn't become apparent until Friday when a question over Yawuru Senator Patrick Dodson's own eligibility to sit based on having an Irish father started hitting the media. When the recommendations of the Expert Panel highlighting racism within the Constitution were handed down, that work could have been expanded upon. The Constitution could have been combed for all of the sections which hark back to racist mindsets, a combined anti-racism campaign could have been mounted by the government engaging input from multiple marginalised racial groups, and a referendum to remove these legacies from the document could have been held. It's 2017, and following the 1967 referendum, the many waves of post-war migration, and the contributions to this society made by people from all over the globe, racism and xenophobia should have utterly no place in our premier legal document. It's troubling that so many on the left are not fighting this battle; that they are simply stating that these are 'the rules' we must follow and are celebrating the downfall of certain politicians while ignoring these same rules' horrific legacy. It's troubling that when challenges to Section 44 were mounted, they came from sitting members on the right mainly because the Coalition power margin was under threat, not from the left on the basis of anti-racism, anti-xenophobia and social justice. I find it particularly troubling due to historical left-wing support of the White Australia Policy on the basis of promoting white Australian workers. The last immigrant in my family tree came to this country four generations ago. Couple this with the fact that I am also Arrernte and therefore have heritage here stretching back 4000 generations and I find myself a severe minority according to recent Census data. If Australia does actually consider itself a multicultural society in an increasingly global world, then sections in the Constitution which discriminate against those who hold dual citizenship based on someone's inherited background have no place. Questions of loyalty based on dual citizenship have no place. Nor does racism. So which side is going to take up that challenge? Great article, it makes a good point that we need to comb through our Constitution to remove the bigotry written into it. If the Left has not moved quickly or strongly enough on this, I would suggest it is because they are already spread thin campaigning to save the refugees on Manus, campaigning to #StopAdani (and other irresponsible mining projects) from destroying our planet, still battling for marriage equality despite everyone knowing that the majority of Australians are in favour of it, supporting the Uluru Statement, fighting irresponsible toll road projects and trying to protect public services and infrastructure from privatisation, defending themselves from government attacks... to name just a few of the many issues. The thing is, all of the issues that the Left are fighting for; we wouldn't need to fight for if we had a halfway decent government. So, the fastest way to solve some of these issues would be a change in government. Hence our schadenfreude about the dual citizenship crisis which may well deliver us a new government - a new government that has committed to fixing some of these things. so the Left will have less to battle. Thank you Celeste for this excellent - and very necessary article. I hope that it finds many readers. Thank you Celeste for setting out the history of how the Aboriginal people have been treated by the legislation of successive governments. It is part of the legacy Britain has left us. I am third generation Australian, my background before 1885 is as Irish as you can get. I have never thought of myself as anything but Australian and was horrified to find that during the first years of my life I had been British. I can't imagine how that could have been - my great-grandfather was an Irish loyalist - I have reports of some speeches he made to prove it. I don't find the expression "The Left" useful when discussing 21st century politics. I have a brother for whom "The Left" in America for example is any combination of people who are opposed to Donald Trump. In Australia for him The Left are those people opposed to Bernardi's Conservatives and First Nation. Commentator Luci presents a number of issues on which the Left is spread thin. I know several people, as well as myself, who are active - as far as our circumstances permit - on some of these issues but none of us would consider ourselves of "The Left". I admire people who go into politics, I admire even more those who manage to get elected. But, at least as far as federal politics is concerned, something changes when they take up their seats in the Parliament. Canberra is a foreign country, they do things differently there. In the brouhaha over Section 44 of the Constitution for example. it is the politics that matter not how we might refine or define what qualities a person must have (or not have) to be eligible to stand for election. Thanks for the information revealed in your article, Celeste. However, I found the leader to it somewhat confusing. If it had not been for progressive people with a social conscience (the left?) speaking our over the years, many of us would not have known about the Australian Constitution and its racist origins. I think the people who should be blamed for the dilemma that we have faced for a long time are those conservatives who have insisted that the Constitution is some sort of "sacred" document that must not be changed or, if this has to happen, undergo minimal change. My understanding is that the document was drawn up largely by the early squattocracy who occupied Aboriginal land and, in many cases, committed genocide against the original owners. This is the reason why extreme right wingers like John Howard get their knickers in a twist when people talk about this history and belittle them by saying they have a "black armband" approach to our history. These conservatives do not want the full history to be told. Are they indulging in a "white muzzle or gag" approach to our history? We need to overhaul our constitution so that it includes our indigenous peoples, that expresses our belief in equality, social justice, human rights and care for the environment. This is why we have to continue the fight for a treaty and strengthen the Reconciliation movement. Thanks for the article. Aboriginal People have always had 'different' treatment under the law; and the current dual citizenship crisis, by a quirk of fate, highlights some legal absurdities/contradictions. When the Invasion happened, Aboriginal People were deemed to be British Subjects; though there were many outrages/examples of where they were not treated as British Subjects ought to be, as history records. South Australian Aboriginal women were the first in the world to get the vote, along with other South Australian women. When the Australian Nation was 'Constituted' these Aboriginal women lost that right. Today, the venerable Pat Dodson could be a dual citizen because of Scottish ancestry. What I mean to say, he's always been deemed a British Subject. Bring on Constitutional reform. Most people I know think s44 is the white Australia policy and find it quite deliciously stupid to watch a few packs of white people chasing others out of parliament over it. It needs to be changed but the race powers parts of the constitution need to go first so we cannot torture refugees and other migrants when we see fit. It seems to me that the ‘problem’ of constitutional change is used by governmts, mostly but not only conservative, as an excuse to avoid dealing with too many important issues. Perhaps if Australians had more frequent experience with constitutional changes we’ld become more comfortable with making them. A referendum to abolish the race powers at the same time as the next election would be a good start. Next might be the abolition of the absurd parts of section 44 at the next election. If the electorate could get used to making important yet easily understood changes, politicians might then find the courage and the electorate the willingness to tackle more complex issues. Celeste, you claim that s44(i) is xenophobic, but say nothing to demonstrate this. It is merely an assertion. There is undoubtedly a troubling history with unfair voting rights legislation but that is not relevant to your simply because it was passed shortly after the Constitution. The race power is indeed a concern, but you have focused only on its detrimental uses and not its beneficial ones. Again, this power has no bearing on your premise. Senator Dodson's potential constitutional issues are not because he's an Indigenous man so s44(i) can hardly be construed as impacting on Indigenous rights. It may be that certain sections of the Constitution were racist in intent and should be re-examined, but a blanket weeding-out of all such provisions is short-sighted because some have been used to positive effect. Citizenship and ethnicity have only a casual relationship. No one is being asked to relinquish their heritage, only their citizenship of other countries. I fail to see how that's unreasonable. It certainly isn't xenophobic. A disabled man is in prison because the justice system fails people with disability. Advocacy organisations highlight his case. The proposed de-funding of NSW and Qld advocacy systems will leave those states with reduced advocacy programs, just as more people with disability will be coming into contact with mainstream services.